The new novel from the Pulitzer-nominated, bestselling author of For the Relief of Unbearable Urges—a political thriller set against the Israeli-Palestinian conflict. In the Negev desert, a nameless prisoner languishes in a secret cell, his only companion the guard who has watched over him for a dozen years. Meanwhile, the prisoner’s arch nemesis—The General, Israel’s most controversial leader—lies dying in a hospital bed. From Israel and Gaza to Paris, Italy, and America, Englander provides a kaleidoscopic view of the prisoner’s unlikely journey to his cell. 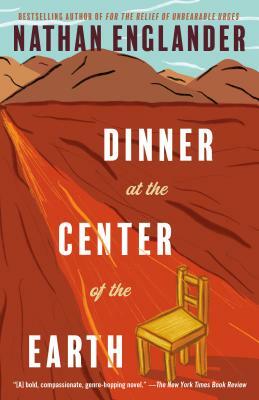 Dinner at the Center of the Earth is a tour de force—a powerful, wryly funny, intensely suspenseful portrait of a nation riven by insoluble conflict, and the man who improbably lands at the center of it all. Nathan Englander is the author of the novel The Ministry of Special Cases and the story collections For the Relief of Unbearable Urges and What We Talk About When We Talk About Anne Frank, a winner of the Frank O’Connor International Short Story Award, and a finalist for the Pulitzer Prize. He is Distinguished Writer-in-Residence at New York University and lives in Brooklyn, New York, with his wife and daughter.